Basically the algorithm reduces bandwidth of a matrix by reordering nodes in a mesh (or vertices in a graph) in the degree order. The figure below shows the original mesh in the example. The mesh has 9 elements and 15 nodes. Two of the elements are type Tri3 and the rest of the elements’ types are Quad4. Degree is the number of nodes one node is adjacent to. The degree ordering begins from the starting node (the lowest degree node), let us call it P and in our example P = 15 with the degree of 2. 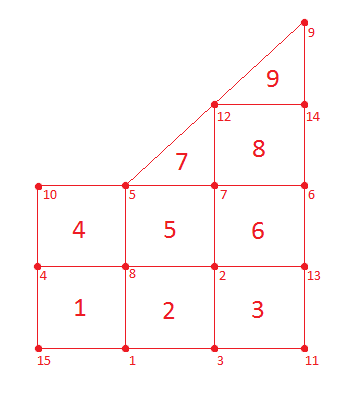 Then all nodes adjacent to P in their degree order (lowest degree first), which are nodes 1 and 4, are added. Now nodes 1 and 4 both have the same degree, which is 3, so their order don’t matter. We decide to add 1 first, then 4. Now since 1 was first we will first focus on nodes adjacent to 1 which are the nodes 15, 3 and 8. Since we already have 15 in our new order list, we skip it. The degree of node nr. 3 is 3 and the degree of node nr. 8 is 4. So again we are ordering the nodes in the increasing degree order: 3 comes first, then 8. Now we will go back to node nr. 4. Node 4 is adjacent to nodes 15, 8 and 10. 15 and 8 are already ordered so 10 will be the next in the order. Now we go back to node number 3 and order its adjacencies. We will continue the ordering until we have ordered all nodes in the mesh. The final order is [15, 1, 4, 3, 8, 10, 11, 2, 5, 13, 7, 12, 6, 9, 14]. This is called the Cuthill-McKee order. Since we want the Reverse Cuthill-McKee order we simply reverse the order and we get the final order to be [14, 9, 6, 12, 7, 13, 5, 2, 11, 10, 8, 3, 4, 1, 15]. First we include all the packages needed in our calculation. PyPlot is used only to visualize the matrices in this example. 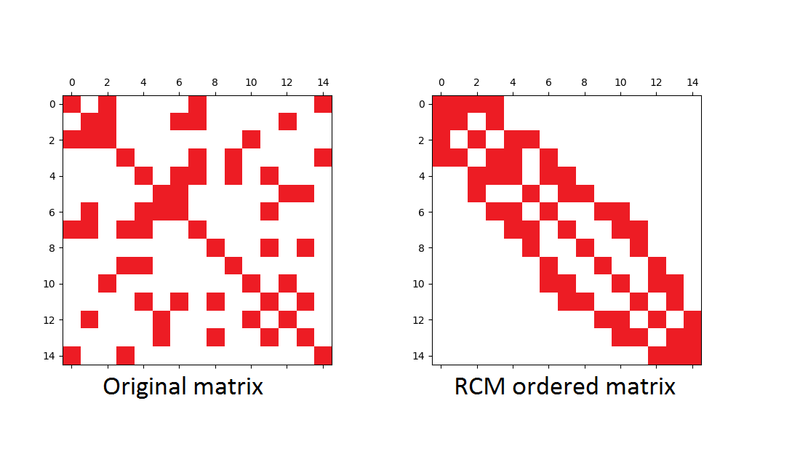 The figure below shows the original adjacency graph and the new RCM ordered graph as matrices.